What is the name of the connector or connection for the display? My player broke and i am thinking about a good way to put the display to good use. Is there any hope? Peter, not quite sure what you are asking. You want to use the LCD for something different? Yes, i want to use the LCD for something different. I don´t know what Controller or Connector. 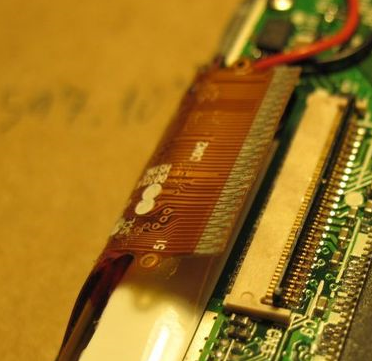 Peter, that is just the ribbon cable and a 51 pin fpc connector. In order for you to utilize the LCD display in some other manner, you will need the datasheet for the LCD. That will tell you what the connections on the display are and what signal they carry. Take a look at the LCD and see if you find any manufacturers markings. Armed with that, you will have to find a circuit that can drive the LCD and a backlight to illuminate it. Not an easy task, but with some luck there is always the chance that something can be made to fit. Hope this helps, good luck. Thank you for pointing me in the right direction. I managed to find a data-sheet that seems to be the lcd. I´ll link it here. I am not a tech savy but i´ll keep trying. Excellent find. Page 12 is perfect to see if and how to interface it to something different. What did you have in mind? I was thinking about connecting it to my raspberry pi. But it seems to be beyond my knowledge. Hi, I d like to put this screen on my raspberry pi b+ too. It works for you? I suppose it is not possible just put the ribbon on the "display" slot?